With thanks to Mira Ink for the copy of this novel! As always, my reviews are non-bias and fair. As a fan of anything Alice in Wonderland related and a huge fan of the first book in the White Rabbit Chronicles, I was so eager to read book two to find out what was going to happen next for Ali and Cole and pretty much everything from that last ending! Book two picks up right from where we left off in the first, and since I had only read Alice in Zombieland a month or so before, I drifted happily back into the adventurous world of Zombies and a few new characters easily. Not to mention our curiosity over what was in store for Ali and Cole romantically, because that element is a favourite of mine from book one and it didn't disappoint in Through The Zombie Glass. Even though they got off to a rocky beginning throughout the book, things soon swayed in their favor. The curious Alice Bell is swamped by ever-changing Zombies and a world full of buried secrets, which is nothing new for the zombie-slayer herself. But things are amped up this time around, and Ali finds herself fighting for more than before. To get to the bottom of whoever is spying on the group, to uncover the many secrets that are still unanswered and to mainly, survive. Alice Through The Zombie Glass never fails at being enthralling, dark and suspenseful, in all the best ways. It's so hard to pull away from, especially after reading for hours and hours! I just found book two a thousand times more enticing than book one, if that's even possible. I must have read over half the book in one day and found myself getting nearer to the end before I was ready. Get ready for betrayal, love and a whole lot of action within those pages. Alice can't help but doubt herself even more this time, and especially now that the Zombies are getting wiser, she must too. I knew that Ali was the same girl, just doubting herself even though she had no reason to and I just wanted for her to know she was just as strong and smart as she had always been. But because of all she had lost, things weren't always plain sailing for her in any aspect of her life. Cole was...the same Cole he had always been consistent as, in his gentle moments. Though he is hot and cold with Alice throughout the book, there is still that fiery connection we all know so well. He loves and cares for Ali a lot, and it shines through the pages, igniting their journey to this point. Some of the characters we like/love are also bright beacons in Alice Though The Zombie Glass like; Kat, Frosty, Reeve, Bronx, Veronica and Gavin. My favourites will always be Kat and Frosty, no matter what. They were the stand-outs for me throughout this book, whereas in book one, I favored Alice. Gena Showalter 100% makes these characters so vivid and no matter how the books will change plot-wise, the characters remain the same, something that I absolutely adore about this series. 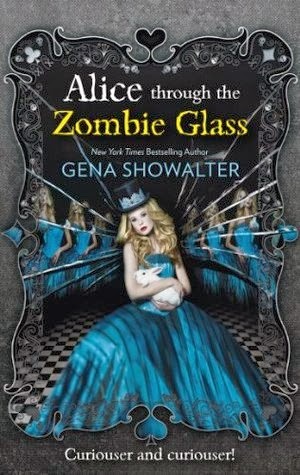 Another immensely action-packed and charged story, Alice Through The Zombie Glass is far more than a book - it's a roller-coaster ride of emotions, fierce slayers and incredible twists and turns that take your breath away. It's no wonder there are so many of us that can't get enough of Gena's beautifully-written pages, characters and of course, Zombieland. Have you read "Alice Through The Zombie Glass"? I've been curious about these books and thanks to your review, I'd decided to just go for it. Sounds really interesting.